Intellitec’s Continuous Duty Battery Guard is designed to protect the vehicle battery from rundown caused by the use of electro-hydraulic motor operated devices, such as lift gates, scissors lifts, or wheel chair lifts. Electrohydraulic systems are used in a wide variety of mobile applications to provide heavy lifting or motion capability. This is a relatively simple method of achieving high mechanical forces without the operation of the vehicle engine. These electro-hydraulic systems consume large amounts of energy from the vehicle battery. Often, so much power is used from the battery that it doesn't have enough energy left to start the engine. This requires a maintenance call to "jump start" the vehicle, and is not only annoying, but also costly. 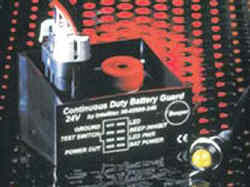 The Guard operates by controlling the coil current to the solenoid used to switch the pump motor. It can be added to almost any electro-hydraulic motor-pump, in the field or on new equipment. It operates by sensing the incoming battery voltage to determine the state of charge on the battery. If the battery voltage falls below a safe level for two minutes, a remote LED will begin to blink, indicating the battery is at a low level. In addition, a beeper on the unit will sound with the LED. A connection is available on the module to inhibit the beeper if silent operation is desired.